Surfing Surgeon Stuck in the Sand: Spa Day!?!?! Yes. Those are my toes. The colors on the right are for the US and the colors on the left are for Afghanistan. Soooo... why in the world are they painted? Is it because of the repeal of "Don't ask don't tell"? Definitely not. I suppose the main reason could be chalked up to boredom. Boredom here is actually a good thing. Boredom means that kids aren't picking up Soviet era ordnance or running out in front of heavy vehicles. It means that US forces and our allies aren't getting blown up by IED's or shot by the Taliban. And it means that I went to the spa for a little "me time" today. 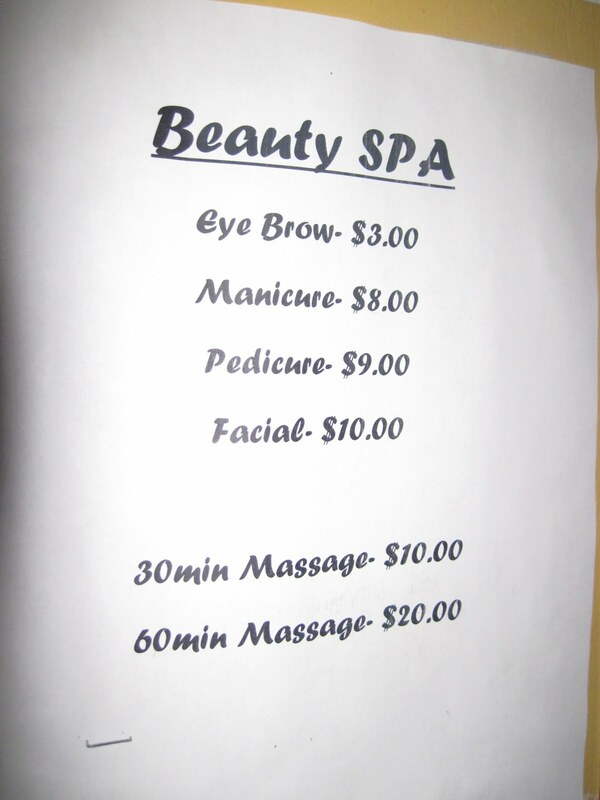 The barbershop and spa are run by AAFES and provide almost all the same services you can get at your typical spa back home. ...and the fact that afterwards you can't go home, sit in the hot tub, and enjoy a glass of Seasmoke. Now, aside from the occasional massage, I'm not a big patron of spas so I can't tell you whether this is a good spa or not, but the ladies are very nice and it killed almost half a day so it was definitely worth it. We started with the manicure and pedicure or "Mani-Pedi" as my lovely wife and daughter refer to it. They clipped my nails and cleaned all the gunk from around and under them and then buffed and polished! Pretty sweet, I guess... But not all that relaxing except for the foot massage part which, truth be told, didn't last very long. That said, I suppose I should be grateful for the fact that the pedicurist would even touch my gnarly dead left big toenail which has been an abomination for years thanks to too much time in climbing shoes and multiple full toenail losses from rugby mishaps. 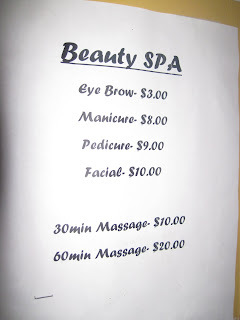 We then moved on to the massage and facial portion of the treatment. The massage was definitely one of the best I've had and included the use of knees as well as actual walking on my back! An outstanding job and, considering the the price, I'll certainly be back for more! When I rolled onto my back for the second half of the massage they started the facial as well. I have no idea what all the different lotions, creams, and masks were that they used but the facial was, without a doubt, as relaxing as the massage. I know. I'm in a war zone getting "pampered" at the salon. What the heck? It certainly is in stark contrast to the way the people we're helping here live and reminds me of how very blessed we all are to live in the United States where such things are taken for granted as normal. Every day, as I look across the valley at goat herders, mud huts and dirt roads I am reminded of how lucky I am. Every night I thank God for the fact that I'm an American and that He has blessed me so richly. What started as just a day at the spa has ended up being yet another reminder of how good I really have it. AAAA-HAHAHAHA!!! LOVE This! You are too funny, and I am thanking God right now that you are bored enough to partake in a Mani/Pedi! WTH? 9 dollars! I am so DOWN with that price! So, little nugget of info for next time...DO NOT photograph that toe EVAR again. Please and Thank you! Stay Safe SDSD! my mom and I enjoyed that post! :) we are glad that you had time to go to the spa, too! Eric: did you see that you and "The Sand Docs" are up for a Milbloggie for Best Navy Blog? I just voted -- best of luck, man! Awesome post. i enjoy reading your blog so much. We are so blessed God is SO good.